Any casual Poker player will be aware of many of the subtle variations of the game. Some forms of Poker are showier and strategy based, while some are more built around simple chance and quick thrill. 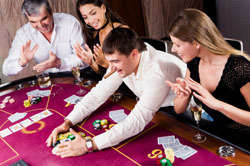 Nearly all incarnations involve the play moving clockwise round a table with players calling, raising, or folding in an attempt to try and get the best five card hand – or at least, to have your opponents believe that that's the case. Most players believe that Poker is best represented in its various Community Card formats. Texas Hold 'em is the biggest Community Card game in America and Canada, with a huge TV appeal and a mass public participation. A Community Card version of Poker is one where cards are dealt face up onto the table for all participants to visually incorporate into their hands. Community cards are cards which are not the sole property of the players: that is where the Hole Cards come into play. The Hole Cards are the cards given directly to players in the initial deal; effectively amounting to an incomplete hand. Players then try to complete their hand by the cards offered in the community pool. Community cards are often laid down in stages such as the Flop, Fourth Street and Fifth Street (Five Card Stud has a Third Street instead of the Flop). The Flop, The Turn, The River, Fourth Street are all terms describing how Community Cards slowly unfold and twist the game in new directions sometimes planned for, sometimes unforeseen.